This recipe has multiple purposes starting with feeding the family dinner or guests during a World Series watching party, or just creating a comforting snack one of these cooler fall evenings. There is something about these sausages and peppers that is sure to find its way into your favorite recipe folder. Prepare grill. Mix first seven ingredients together in large bowl to coat peppers and onions well. Grill mixture on an oiled rack above coals under just tender. Meanwhile, prick sausages with a fork and grill on medium to low until just cooked through. Spread butter on inside of buns and toast on grill until golden. 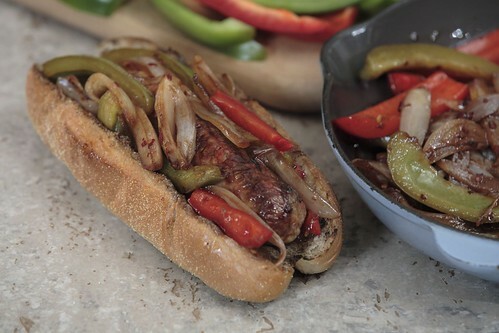 Insert one sausage in each roll and cover with pepper onion mixture.